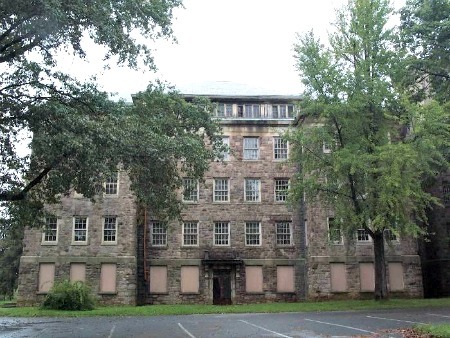 Is Trenton Psychiatric Hospital Haunted? Trenton Psychiatric hospital started out as any other treatment center of the day, originally being called the New Jersey state lunatic asylum. Its creation is due to an activist named Dorothea Lynde Dix who worked on behalf of the population deemed to be insane, and her efforts saw the first was wave of the countries lunatic asylums open. The architect was a Scottish immigrant named John Notman who was commissioned by the state to design the building which was based on the Kirkbride plan, which was a standard layout for asylums at the time. Its doors opened on the 15th of May, 1848 and its capacity was around 90 patients, though this was often exceeded. Under the first superintendent, Dr Horace A Buttolph the hospital treated 86 patients. It later changed its name to the New Jersey state hospital at Trenton and in 1907 employed its first medical director who was a man named Dr. Henry Cotton. What he did at the hospital earned it a place to be remembered as a place of intense pain and suffering. He left the hospital in 1930 and died three years later, but the brutal practices he installed went on right up until the 1960's, cruelly continuing his legacy of suffering. Early Mental asylums have always been known to places of torment and unfavorable treatment to say the least, but to make one stand out above all the others in terms of suffering takes somewhere truly special, and Trenton psychiatric hospital is definitely the right place. The asylums first medical director, Dr. Henry Cotton created a set of practices for his patients that today are viewed as horrifically barbaric. He believed that the cause of mental illness was general infection in the body, with things such as rotten teeth and festering wounds. His answer to this was remove the part which was infected, or could possibly become infected. This led to the amputation and removal of many body parts of his patients, with whole arms and legs being amputated to be common practice. Teeth were pulled out constantly, and everything from a single finger or ear to all four limbs being removed was not unheard off. In fact Dr. Cotton made it well known what he was doing at the hospital, believing himself to be a pioneer in treating mental illness, and he published many papers and reports on his work. One thing he did with his patients was to remove body parts often against the consent of the family. His practices claimed the lives of hundreds of patients, and maimed thousands more, with mutilated patients common in the area due to the horrific ideas of Dr.Cotton which he often got away with due to the governing bodies of the day and their understanding of mental illness. Now as you can imagine if anything is going to create lingering spirits then this place fits the bill. As for the ghosts themselves they are thought to all be those of the patients that died within the building. But the most well known ghost is thought to be that of Dr. Cotton himself who has been seen wearing a white doctors coat and walking down the corridor in the area outside his office. The most commonly reported phenomenon at the hospital is that of disembodied voices, mainly muffled screams and moans coming from distant rooms. Orbs can be caught through the building at any time of day, with some having a strong pale blue glow to them. There are also tales of seeing the ghosts of patients with arms and legs missing who have been seen in some of the rooms upon someone entering them, only to fade away after a few seconds.